Stardust VR is a stationary wave-shooter without a story. Armed with a singular pistol, it’s your job to dispatch the flying enemies placed in front of you until you win, or you die. There are a few different modes available where you play against the AI or online in vs or co-op action! It’s just so freaking peaceful! In one hand you have your gun while your other hand is used to perform a few tasks or use a shield. There are 3 modes available with each mode playing a little different from the others. 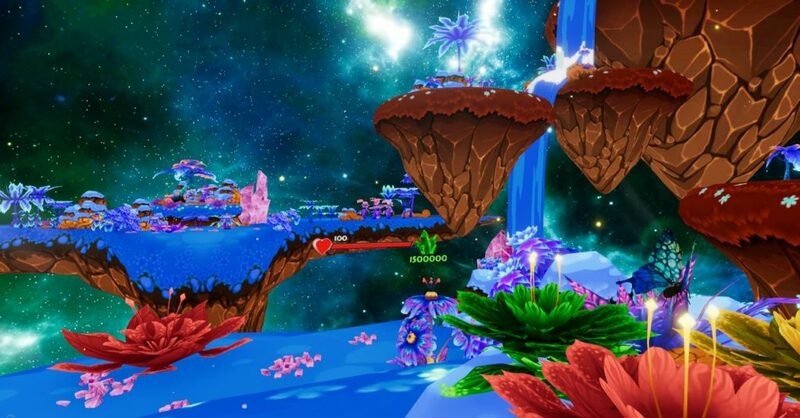 The first mode, Floating Island, has you standing in front of some flowers while across from you is your opponent, human or AI. What you need to do is spawn little dragon dudes to go a retrieves eggs which you must then place in the flowers to incubate and spawn 1 of 5 creatures that then go off and try to hurt the enemy. While you are doing that, your opponent is doing the exact same thing, turning this into an odd little multi-tasking shooter as you must take down the hordes of creatures, he sends your way while spawning your own troops. Whoever takes to much damage loses and its game over. 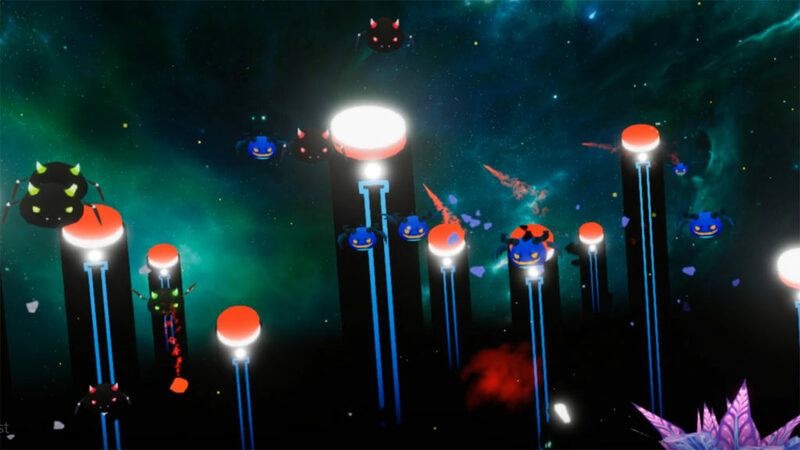 The second mode, Space War, is just a straight up wave shooter though with added power-ups and as each wave gets steadily harder, you are going to have to be on your toes as you only have 1 life. The last mode, Pacifism, is similar to the Space War mode, save for the fact that you only have 2 shields now, no guns, and must deflect incoming bugs until you die, chasing a high score. All the modes work as they should and even playing single player are fun in small doses and while multiplayer is supported, you may have to line up a match outside of the game somehow as no one played during the few times I was on. 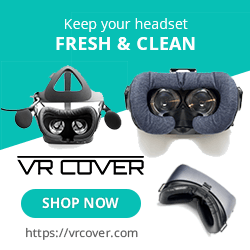 Stardust VR looks very clean and goes for a much more cartoonish feel. Each of the 3 modes has you on a small floating island in space and enemies pop up 180 degrees in front of you, for the most part. 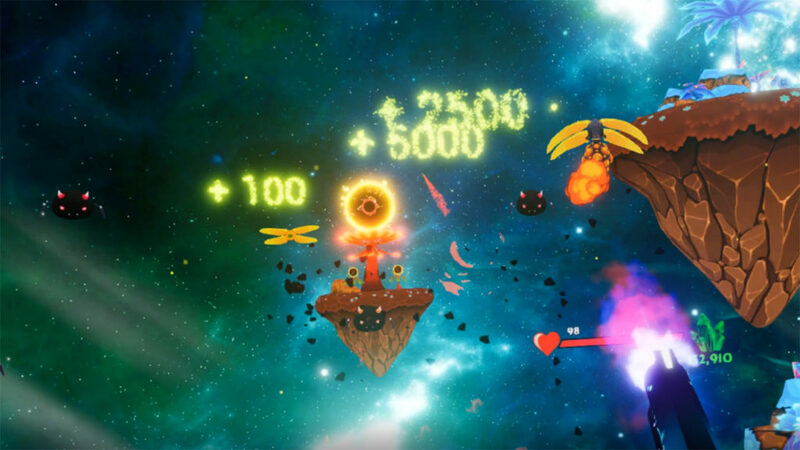 The color palette used is bright and colorful with a good-looking space background and either more floating islands off in the distance in 1 stage or a bunch of black pillars with colored tops that bounce to beat in the latter 2 modes. Your sole weapon carries minimal impact, but this is intentional as the game shoots to be both relaxing and charming. Enemies are simple by design, which makes sense given just how many can populate your screen at one time. Every larger enemy divides into more or smaller versions of their larger selves so depending upon what you shoot, you could be facing dozens of foes at one time. The audio is wholly original and nothing you would expect for a wave shooter as the music sounds like it was ripped right from my last visit to a relaxing spa. It’s an odd blend of gaming and visuals to constantly be shooting at incoming enemies, but in such a serene atmosphere. Your gun is intentionally muted as are the enemies who, when shot, disappear into a small cloud of smoke with nothing but a small pop and thanks to some decent 3D audio, you can always hear when an enemy gets to close. Multiplayer is available, but when I tried to play, I could never find a match and I don’t think more then a few dozen people have bothered to pick this up and play it, making this, for all intents and purposes, a solo experience. Each mode has difficulty settings so you can tailor the challenge to your liking and it’s commendable that each mode plays up different from the last. With that said, the entire vibe I get from this game does make it feel sort of the same. The zen-like presentation counters what can be a lot of hectic activity making for a game that just feels kind of dull. It’s not inherently bad or anything, but when combined with the fact that the only reason to replay any mission is to climb the online leaderboards, for myself there really isn’t much here to keep my interest. The enemies can get overwhelming if you let them. Stardust VR isn’t exceptional when it comes to VR wave shooters, and while the individual modes do offer their own flavor and even some unique aspects, it still ends up feeling like just another wave shooter. Not bad per se, but not exceptional and while I did enjoy my hour or so of playtime, I doubt I’ll revisit this down the road. What would I pay? If you love wave shooters, then I think you will enjoy what’s here. The $9 asking price is alright, but like I said, there is very little reason to come back to this after you visit each mode once or twice. Frozen Dreams provided a press code for this title and, regardless of this review, we thank them for that!